Today, several special units have already been supplied with the Underwater Diver Panel. A tablet device designed to function underwater works as a navigator, allowing commanders to monitor biometric indicators of the commandos. Commando divers of Russia’s Defence Ministry have now been provided a unique waterproof tablet computer, which not only displays navigational information, showing the location of each fighter on an underwater map, but also data on frequency of breathing and heart rates of each of them. 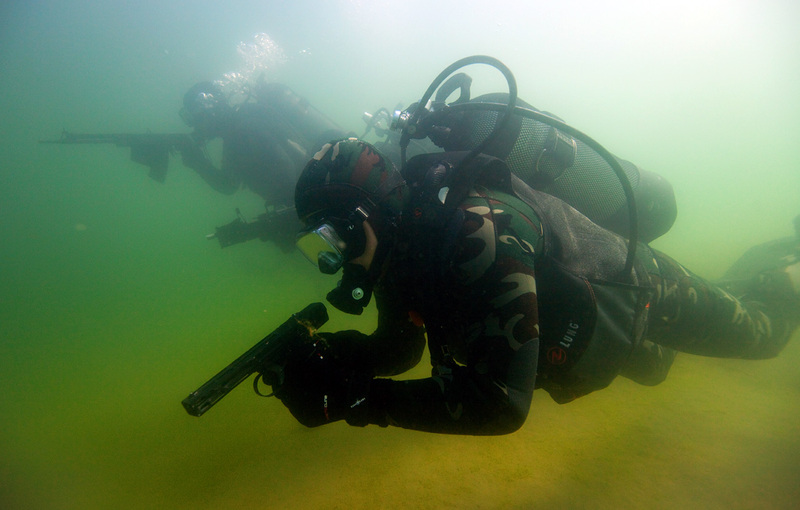 The latest device – the Underwater Diver Panel (UDP), developed by the Central Research Institute Kurs, significantly increases the safety of underwater operations, warning in advance of any potential problems or dangers. The UDP is a lightweight aluminum block less than 30 cm long and 10 cm wide, equipped with a 16-cm screen. The device, which weighs less than 5kg, can work for up to seven hours without recharging. The metal body allows it to operate at depths of up to 80 meters. The device is useful not only for military reconnaissance and sabotage groups, but also engineers conducting deep-sea operations in rigid diving suits. The display panel on the unit is divided into two parts – the right shows blood pressure, pulse rate and respiration of the diver, obtained from sensors on the wetsuits. The UDP displays health indicators of up to four divers at a time. If the set parameters are surpassed, the device sends a signal to the operator. The left side of the UDP display monitors the underwater navigation of the team – it displays data from the portable sonar and the GPS-receiver which, with the help of the integrated computing unit, is shown on a single map. On it, within a radius of 500 metres, all men of the group are marked in dots, showing the depth they are at under water and speed of movement. Military historian Dmitry Boltenkov said military frogmen, unlike ordinary divers, operate in complex hydrographic conditions, mainly at night, when visibility in the water is at a minimum. The first such tablets started being used by special units in the armed forces of developed countries several years ago. For now, such products are being used in large numbers only by the French “Commando Hubert”, the American “Seals”, the German Navy’s “Sixth Command” and swimmers the British Navy’s special operations group – the “Special Boat Service”.